IE Tab is a Firefox add-on or extension which enables you to embeded Internet Explorer in tabs of Mozilla Firefox. Firefox is a customizable browser and you can always add new functionality to it. It is very easy to install IE Tab and will add two new items to the context menu which can be opened with right click at mouse. So whenever you want to test or see any webpage in Internet Explorer, you don’t need to open a new IE window, you just need to go to context menu and click “Open link in IE Tab”. This property is very helpful for developers who need to check their webpages in cross-browser environment. 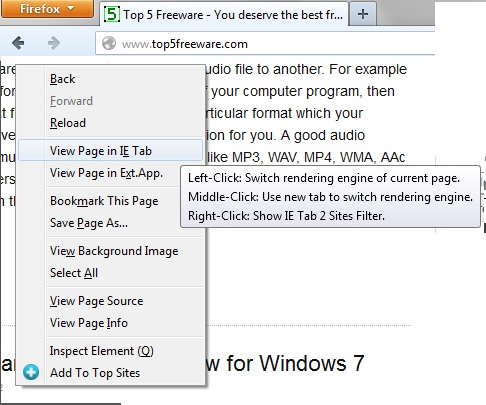 IE Tab provides you with a cross-browser environment in which you can view a webpage in different browsers without actually switching from one browser to another. People generally don’t like Internet Explorer and use Mozilla Firefox but many a times there comes web sites which can’t be viewed without IE. Then switching from Firefox to IE and vice-versa becomes a time consuming process but IE Tab enables you to view web page in IE from within the Firefox and that too at single click. IE Tab completely supports Internet Explorer configuration options which means that you can directly configure IE as per your requirement from within the IE Tab. IE configuration means the settings of the browser like internet settings, security settings etc. which can be automatic or can be manually set according to the user requirement. Auto URLs are basically the filters which can match more than one URL. Some web pages can only be viewed with IE and you can configure IE Tab extension to do that automatically for the URLs you specify. So when a web page is displayed by Firefox, IE Tab extension will automatically check whether that web page should be displayed using IE or not. 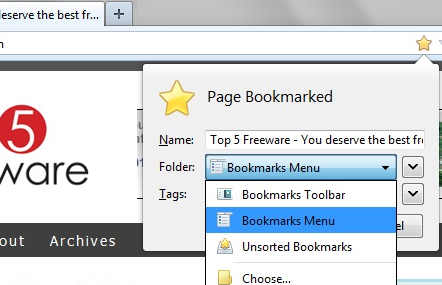 You can set IE Tab bookmarks which will enable you to automatically load a web page in IE Tab i.e Firefox bookmarks can be automatically opened in IE Tab. IE Tab has full support for IE features like it can display the web pages that need ActiveX controls; it can test web pages with IE’s rendering engine; it uses Outlook Web Access; it uses Windows Explorer view for browsing the local file system; it has full support for Explorer icons, right-click menus etc. and much more.